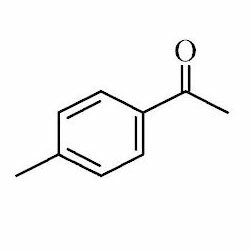 We are one of the leading manufacturers, exporters and suppliers of 4-Methyl Acetophenone which is formulated from the high quality chemical compounds. This range of chemicals is widely used as an intermediate in manufacture of bulk drugs and in perfumes and cosmetics. Our clients can avail these chemicals from us at very nominal prices. Used as an intermediate in manufacture of Bulk drugs and in perfumes and cosmetics.